The Sound of Music – Did You See That One? Based on the book The Story of the Trapp Family Singers by Maria von Trapp. After struggling to fit in at the convent, Maria (Andrews) finds a chance for a new start as the governess for the seven children of a retired Naval Captain (Plummer). When you talk about film musicals this is one title that can’t be left out. The film is based on the life of Maria von Trapp as she detailed in her book “The Story of the Trapp Family Singers”, which was published in 1949. The book was first adapted into the popular Rodgers and Hammerstein stage play by Howard Lindsay (Swing Time) and Russel Crouse (Life With Father). This film was written using elements of Maria’s book and the play, and adapted by Ernest Lehman (West Side Story). Oscar winner Robert Wise (Citizen Kane) was chosen to direct the film. The film went on to win five Oscars including Best Picture and Best Director at the Academy Awards. 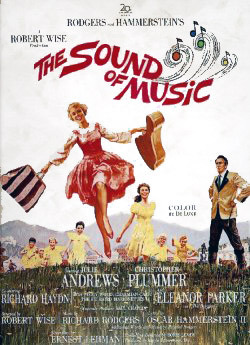 The cast for this film is anchored by Julie Andrews (Thoroughly Modern Millie). She was spotted by producers during production of Mary Poppins and immediately signed to lead this movie. She was joined by Christopher Plummer (The Insider), then unknown to most movie goers. Eleanor Parker (Interrupted Melody) was cast in an effort to bring some star power to the film since Andrews and Plummer were not yet recognizable names. Richard Haydn (Mutiny on the Bounty) and Peggy Wood (The Right to Live) also joined the cast that features a number of other talented actors. The story put together for this film is a more serious and thoughtful version of the story told by the stage play. The writing does a great job taking out much of the overly sentimental content that made the story far too sweet. Instead, the story operates with a great amount of emotional content that works to give the characters depth, and also to show the stakes they’re facing throughout the film. The minor story lines all work nicely, allowing even the supporting cast to shine throughout the movie. The dialogue, while still a bit sentimental, feels thoughtful and honest. Christopher Plummer worked with Ernest Lehman in developing the character of the Captain, creating one of the great voices in the story. While modern film audiences might find this a bit cheesy, the story works on every level, and uses the backdrop of the impending war in Europe nicely. Julie Andrews is wonderful in this movie. She not only does a great job with the acting, but her singing talent is on full display throughout the movie. She was the only actor in the film not to have a voice double thanks to her natural abilities. Andrews earned her second Oscar nomination for Best Actress in a Leading Role for her work in this classic. She also has real chemistry with Christopher Plummer that brings out the friction and the feelings between the two. Plummer also does an excellent job as the stern and rigid Captain von Trapp. He brings a sense of humor to the role that he slowly reveals throughout the story. His character’s evolution is a great testament to his skills. Eleanor Parker does a great job with her role in this one as well. She has the unenviable task of playing a sort of partial antagonist. She does a good job not overplaying her role, and adds a lot to the film. Peggy Wood and Richard Haydn add nice performances of their own to this classic. Peggy Wood’s performance earned her an Oscar nomination for Best Supporting Actress. These stars make up just a few of the people who delivered nice work for this film. It would also be unfair to leave out Charmian Carr, Heather Menzies, Nicholas Hammond, Duane Chase, Angela Cartwright, Debbie Turner, and Kym Karath who make up the seven von Trapp children. Their performances help to give the film the endearing quality it deserves. The music in the movie is wonderfully done. In addition to the songs used from Rodgers and Hammerstein’s play, Rodgers penned two new songs for the film. The movie would win an Oscar for Best Music thanks to the great work done by Irwin Kostal (West Side Story). Somewhat fittingly, the film would also win Best Sound. The movie’s visuals are also wonderfully done. The cinematography captures the beautiful locations the filming was done at perfectly. The camera work also helps in setting the tone for each moment of the film. The great work earned Ted D. McCord (Johnny Belinda) an Oscar nomination for Best Cinematography. The editing does a great job keeping the pace of this movie going. Running almost three hours, the film seems to move nicely. William Reynolds (The Godfather) won an Oscar for Best editing for the work he did on this one. The film was also be nominated for Best Costume and Best Art Direction. This is a great musical, and one of the films I was raised on. If you’re a fan of musicals you should’ve already seen this one. If you’ve missed it, please make the time. I would also suggest this one to fans of the stars. It’s interesting to see the early performances from Andrews and Plummer in a time that they weren’t the stars they are now. This is a fun family film with enough depth to avoid being cheesy. I give this one 4.5 out of 5 stars. Pingback: The Night of the Iguana – Did You See That One?